What a delectable book! I confess that I cannot wait for the summer fruits (cherries, peaches, nectarines, plums, apricots etc.) to be ready to be enjoyed. When fruit, any fruit, is in season, I find as many ways to use as possible. I preserve – make jams, marmalades, chutneys. I freeze, bottle, dry. I stew, make fruit salad, fruit “ice cream”, bake in tarts, pies, muffins… add fruit to salads, eat as is. Rarely have I thought to add fruit to savoury meals, except for the traditional cooked apple with roast pork, Bernadette Worndl celebrates the joy of fruit in ways I had not thought but cannot wait to try. Pick up a copy of this book and you will be delighted with the range of traditional and creative recipe inside the cover. And now is the perfect time to think about creating that perfect homemade gift for the coming festive season; who doesn’t like to receive a gift made with care and love? A homemade cake, tart, jam or preserve or even something to sip on those hot summer nights; Blueberry liquor sounds just what I might need. 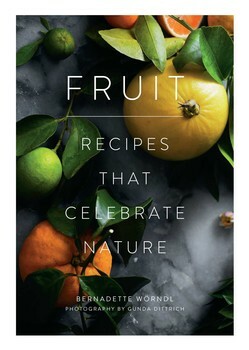 Fruit, Recipes that Celebrate Nature is a perfect gift for the home cook or your own kitchen library. This entry was posted in Best Reads of 2018, Book supplied by publisher or author for review, Cook Books, Food and Drink, Post Script: Book Reviews, Recipes and tagged fresh fruit, fruit, jam, marmalade, preserves, sauces. Bookmark the permalink.